According to the most recent Georgia crash data, 1 in 6 traffic fatalities result from a crash involving a large truck. Tractor-trailer and other heavy truck accidents are far more likely to be deadly or cause serious injuries because trucks can weigh as much as 80,000 pounds, while passenger vehicles weigh only 3,000-5,000 pounds on average. If you or a loved one has been injured in a truck accident, you may be able to obtain compensation from the at-fault truck driver, the trucking company that employed the driver, the owner of the cargo or other responsible parties and their insurance companies. An Atlanta truck accident lawyer at Parsons & Associates, P.C., can help you understand, protect and enforce your legal rights after a serious accident involving an 18-wheeler or other large commercial truck. Based on crash data collected over the course of a year, trucks accounted for only 4 percent of all registered vehicles, yet they made up 8 percent of all vehicles involved in fatal accidents. There were 3,675 fatalities in accidents involving large trucks. There were 80,000 people injured in large truck crashes. A total of 276,000 large trucks were involved in crashes over the course of the year. Occupants of vehicles other than trucks were the most likely to die in truck accidents – 76 percent of the fatalities in large truck crashes were occupants of other vehicles. Occupants of other vehicles also accounted for 73 percent of those injured in large truck accidents. 10 percent of the fatalities in large truck crashes involved non-occupants, such as pedestrians or bicycle riders. Only 15 percent of the fatalities in large truck crashes involved someone in the truck. Twenty-five percent of those injured in truck accidents were occupants of the truck. 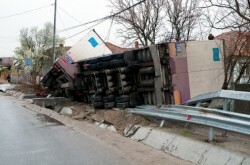 In many truck accident cases, the crash could have been prevented if the truck driver had been more careful and responsible. Speeding, which was a contributing factor in 7 percent of fatal large truck crashes. Straying from the correct lane, which was a factor in 6 percent of fatal large truck crashes. Distracted driving, which was the cause of 6 percent of fatal large truck accidents. Rollovers. Trucks have a high center of gravity, especially when they are fully loaded. As a result, a truck is more likely than a passenger car to tip over. Jack-knifing. This occurs when the trailer on a tractor-trailer essentially spins out at a perpendicular angle to the truck. Under-ride accidents. A car can actually slide underneath a truck, causing injuries to drivers and passengers. Tailgating. Trucks have a much longer stopping distance than passenger cars. When a truck driver doesn’t leave enough following distance, the truck may be unable to stop before rear-ending the traffic ahead. Blind spots. There are large areas on the back and sides of tractor-trailers and other large trucks that drivers cannot see. Brake problems. Many trucks use air brakes, which require more extensive maintenance and which drivers must understand how to use safely. Wide turns. Because of the size of a truck, most have to make wide turns, which can result in accidents. Driver fatigue. While the FMCSA sets maximum drive time rules and requires drivers to keep logs, unfortunately not all drivers follow the rules. An overtired truck driver may fail to drive safely and could even doze off behind the wheel. Who is Responsible for a Large Truck Crash? When a Georgia truck accident occurs, it is important to determine who was at fault. A truck accident victim can file a claim against a negligent driver to obtain monetary damages for medical costs, lost wages, pain and suffering, emotional distress and other damages. However, the truck driver (and the driver’s insurance company) may not be the only potential defendant responsible for paying a truck accident claim. If a trucking company is negligent in its own right, such as by failing to check a driver’s record before hiring him or by failing to make sure the driver is following safety rules, then the trucking company could be sued. A trucking company could also be sued based on a rule called vicarious liability. This rule essentially says that a trucking company is held legally responsible for the negligent or careless behavior of its employees. It might also be possible to bring a legal action against the shipper, the company that owned the cargo, the company that maintained the truck and trailer, a manufacturer or other parties whose negligence played a role in the crash. At Parsons & Associates, P.C., our experienced Atlanta truck accident lawyers know that truck accidents are often very serious and complex. We understand that you might be coping with major injuries or with the tragic and untimely death of a family member. During this stressful time, let us take care of protecting your legal interests. We can assist you with every step of your truck accident case, from gathering evidence, to determining who could be held liable, to filing a lawsuit, to settling your claim out of court or taking your claim to trial. At every step of the way, we will use our legal experience to provide you with the compassionate and competent representation you deserve.